Finding a good-sized SUV vehicle to drive near Gilbert, AZ, can be a bit complicated. After all, you not only need to get something that is spacious, but also a vehicle that is nimble enough to drive on busy streets. Thankfully the 2019 Mercedes-Benz GLE has got you covered. Now, you can find out how it compares to another popular model: the 2019 Lincoln Nautilus. Let’s check it out. First off, you’ll find yourself with 329 horsepower and 354 lb.-ft. of torque on the base trim of the GLE. This is far more than the 2019 Lincoln Nautilus, which only has 250 hp and 280 lb.-ft. of torque. The 2019 Mercedes-Benz GLE 400 4MATIC®* can tow up to 7,200 pounds, so if you have a small recreational boat or trailer, the GLE is a good option. Speaking of recreation, the GLE can fit a lot of items inside! You’ll have a cargo space of 38.2 cubic feet behind the seats, but if you fold them down the number increases to an impressive 80.3 cu. ft.
You can potentially find yourself with more technology features in your GLE than in the Nautilus. For example, if you want cooled and ventilated front seats you can choose to have this feature added on. However, you do not have this as an option for the base trim of the Nautilus. Likewise, you’ll have a standard sunroof on the Mercedes-Benz GLE, but if you want a sunroof on the Lincoln Nautilus, you’ll find yourself paying a bit extra to get it. Finally, you’ll see all-wheel drive as the standard drivetrain on the 2019 Mercedes-Benz GLE 400 4MATIC®*. This is great for if you need to utilize that towing capacity of the GLE or need to drive in whether that isn't ideal. 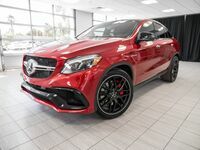 So, if you are looking for a solid choice for a family vehicle you can use for everyday life as well as on adventures, then the 2019 Mercedes-Benz GLE 400 4MATIC®* is a good choice. Thankfully, you can get it right here in Peoria, AZ! Come on over to Mercedes-Benz of Arrowhead today to test drive this excellent vehicle. We are a Mercedes-Benz dealer located near Gilbert, AZ, and we would love to tell you more about the Mercedes-Benz lineup.